The one thing the New World had in abundance that the Old World didn’t was running room. Land in abundance was the siren call of the New World, promising ownership to thousands who couldn’t have dreamed of owning land in the Old. The records of that land are among the great genealogical treasures we use, day in and day out, to try to build out our family histories. And, every so often, somebody makes that a little bit easier for us. The Legal Genealogist‘s friend Larry Head provided the link to the website, and it’s a gem — well worth the time and effort for anyone with Arkansas roots to explore. 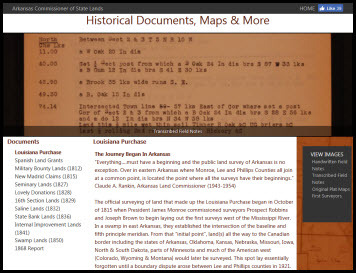 It tracks the land developments in Arkansas from the time of the Louisiana Purchase all the way forward into the 1868 survey of counties, with many digitized images and records. It’s a great website for Arkansas research overall, well worth the time to read through carefully… and see what you can find on your ancestors who spent time there in the Land of Opportunity. Already been there, done that: From the depths of the law library. Does Missouri have anything similar??? Most of my ancestors were in Missouri and something like what Arkansas has would be invaluable.